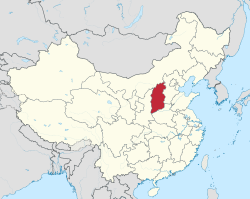 Shanxi (山西; shānxī) is a province in Northern Central Region of China. Taiyuan — the capital city of Shanxi Province. Datong — home of the Yungang Grottoes (UNESCO World Heritage Site). Pingyao — site of Pingyao Ancient City (UNESCO World Heritage Site). Nearby are Shuanglin Temple, Zhenguo Temple, and many Shanxi merchant family compounds. Yuncheng — location of Yongle Palace and Guan Di Temple. Bus from Nanjing to Yuncheng: Departs at Nanjing bus station (beside Nanjing railway station) 16 hours. Buses do not run from 2-6am in the morning due to traffic laws. Sleeper buses available. Shanxi's violent crime rates are higher than China's average. But no tourists are reported to get hurt in tourist attractions. Normally, outer regions of the major cities in Shanxi are more dangerous than their inner regions. Mine disasters in Shanxi are frequently reported. Most of them are caused by the lack of safety and the lag of equipments. This page was last edited on 28 January 2019, at 20:38.